In one of his letters describing his efforts, Captain Wynne enumerated the buildings he and his men had built during their first year at Avalon. These, he wrote, included among others the mansion house, kitchen, tenements, a brew house, henhouse and forge. He then relayed to his employer his plans for a second row of buildings, "so pitched as to make the whole a prettie streete." View of Edward Wynne's "Prettie Streete"
Archaeologists, who thought that the "prettie streete" would be little more than a dirt track meandering through the settlement, were surprised in 1994 to find the first traces of a cobblestone pavement near the western edge of the original settlement. 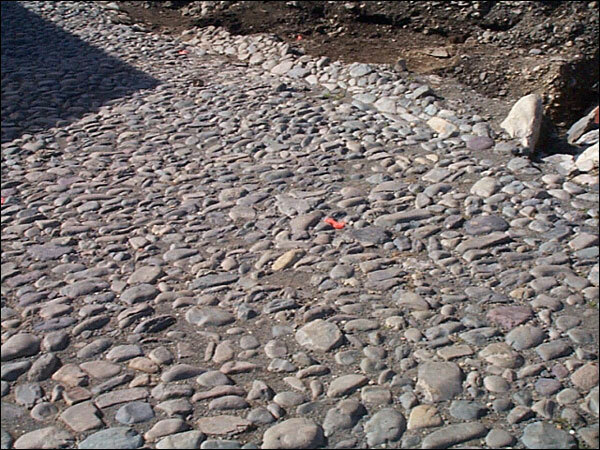 Parts of the south edge of the street were found in front of the forge, and the actual end of the pavement, some 4 metres (13.1 feet) wide, was found a short distance to the west. Early in the 1996 field season a second cobblestone pavement was found at what later proved to be the eastern edge of the settlement. 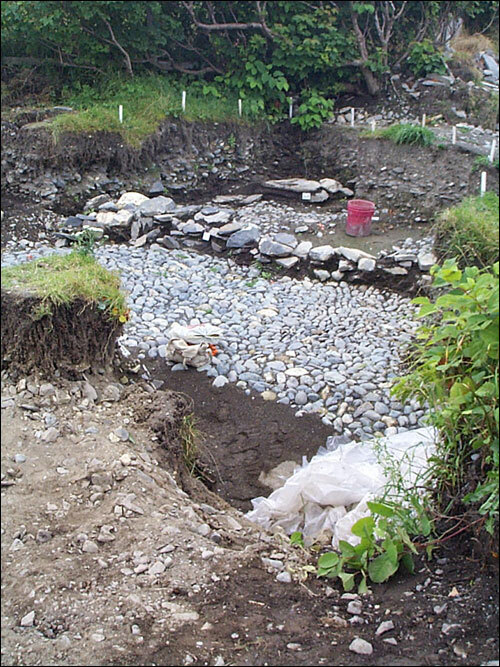 Excavation later proved that this pavement was also 4 metres (13.1 feet) wide and that it extends for more than 4.5 metres (14.8 feet) westward, where it disappears under the existing paved road. There seems little doubt that the two stone pavements are part of the same construction and that they are the ends of Captain Wynne's "prettie street," a 121 metre (396.9 feet) pavement that led through the original Colony of Avalon. The street more or less parallels the present paved road, but may actually have a slight curve in the opposite direction, and probably meanders slightly more than the present pavement. Near both ends of the pavement, branches, or side roads or paths, have been revealed. At the west end a narrow cobble patch leads northward toward the harbour front. Near the east end a wide pavement leads southward from the street towards a dwelling of one of the early Ferryland gentry. The dwelling is believed to have been the residence of the Kirke family, beginning in 1638. The pavement may have been a courtyard that led to the main entrance of the house.